Okay, some of you know that I'm making a Dark LBT fic, and I've run into a little problem with it. You see, there's a point where the gang is found as an enemy to the residents of the Great Valley, because of something they did. (This will be revealed in the fic.) With their families gone, (They all died horrible deaths if you must know.) they had to strike out on their own and take care of eachother. Years later, they return because the valley is in danger. However, if they were revealed who they were, the Valley's residents wouldn't want their help. So, for this reason, they change their names. Yeah, that's about it. So, what names would you like to be given to them? I'll take all suggestions. Just understand, I may not pick yours for whatever reason. Sometimes, it may be that I still can't pick one and just picked randomly. Believe me, I could really use the help. I'm not good with names either. I admit this story sounds like the kind I wrote so much about. Oh, and Thunderfoot I actually got from a little article of the original LBT movie. 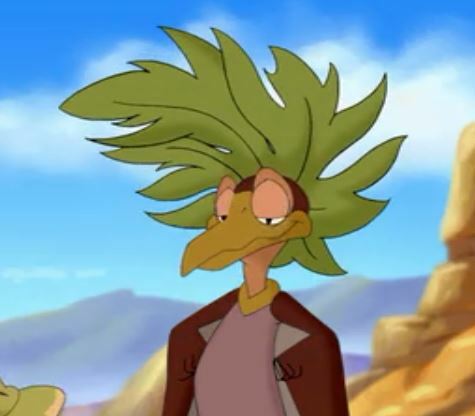 I can't remember the website at the moment, but it said that Littlefoot's originally planned name was Thunderfoot. They just didn't put it in because it wouldn't've worked with kids. Oh, and here's a little something for my fic I think you should know. Despite them being fully grown, Ducky will still keep her classic habit of repeating herself, and Petrie will keep his special sentence structuring. To me, it's what makes Ducky, Ducky and Petrie, Petrie. To me, destroying that destroys their charcter. I thought that in a dark LBT fanfiction dark names might be required. Pluto, the good of the underworld was the only dark mythological name I could think of that begins with a P (there are other characters as well but they are not exactly gloomy). Anyway, nowadays Pluto has lost any dark connotation anyway. As for Ares you are right that it is a male name. Apart from the dark connotation it was the simple way in which it could be constructed from Cera's name which made me think of it. I reckon Latin and Greece offer plenty other dark words to be used, but I confess it is difficoult for me to think of such gloomy names for characters so "un-gloomy". Dark names aren't really required in a Dark Fic. Though they are recommended at some points. I have read many a Dark Fic where there were NO Dark names. In some, it was the sadness within the charcter, the great amount of depression they felt that made it dark. In others, it was what was happening to the world, being so unnatural, that only a force of darkness could've made it possible. What makes a Dark Fic a Dark Fic is the atmosphere. With just the right atmosphere, you can scare the reader in a very easy way. There is nothing of horror inside, yet it is the atmosphere within that scares you. You continue to read. Cursing yourself for reading it and yet wanting more. Worst of all, when you reach the end, even though the evil is destroyed, you meet with a sad ending. One you wished you never read. That, my friend, is a true Dark Fic that's taken VERY seriously. Dark fics can be difficult, but can be a great achievement in the end. I've got the whole plot figured out and all, but without the fake names, I just can't continue! This is driving me nuts! Please, I really need the help! Freefall! Like the one in Dinotopia! Can't help you with the others but I think it would be interesting to see Petrie take on his dear old uncle Pterano's name : . Petrie... we endorse the name of Freefall for. Those are my thoughts for names. Yeah they are derived from their species' names. Well except for Cera's. That was derived from name of the genus that includes all frilled dinosaurs. Heh... Just Realized that it's from Starfox Adventures. The Stegos are called Thorntails. that's probably where you heard it from. Yes, that is where I heard it from. Okay, let me explain the plot in full and so that you can all get the basic idea of why this topic exists in the first place. It has been 20 years since the gang arrived in the valley for the first time, and things are not as they seem. The once proud, thriving paradise has now become a vast wasteland that thrives with sharpteeth. The gang we know and love has been framed for a crime they didn't commit and were forbidden to ever live in the valley ever again. After many years, they have changed greatly in size and appearence. Now with the intent of clearing their names, a new journey begins. They soon learn that to clear their names they have to restore the valley to what it once was. However, they'll soon find that the one behind all this is a friend. One they thought would never betray them. As you can see, this has quite the plot in mind. Now, since they are coming back to the valley to clear themselves, they have to change their names if they wish to even step foot into the valley. So naturally, they change their names. Keeping in mind of the dark atmosphere that this story holds, I wish to go with rather dark names for the group. Yet, that is where I'm having the biggest problem. So, this is why I've asked for help in the first place. "Me call meself "PTERANO!" Just like my uncle! It big, STRONG name!" Started by MurMur on It's Party Time!